Which pushed the axle back(pic attached), this is the last work I've done on it and just don't have the time to throw the old lower control arms back on it. 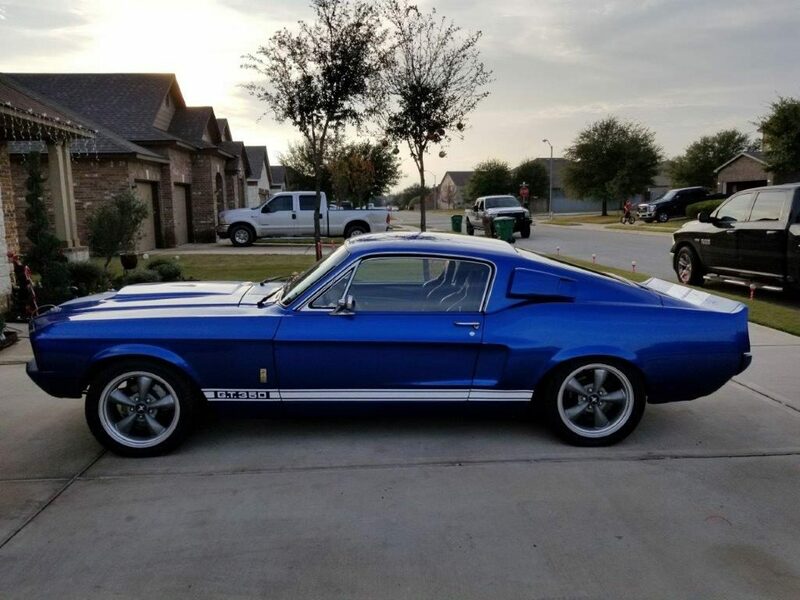 The car is definitely not very "original", I'm pretty sure the VIN doesn't even match a fastback body. Still and awesome car, I'm motivated but not desperate so if we wants to find some offers that'd be cool.ling on. The only repair ever done on it was replacing the power steering/brake pump when it blew out. The engine/transmission have never shown any sign of issues. I only used mobil1 oil filters with royal purple when changing. I will help in any way I can with coordinating shipping within the U.S. but buyer assumes all cost related to transportation of the vehicle. Professional pre-purchase inspections are welcome but must be made before the auction ends. I have described the above mentioned vehicle to the best of our ability. However, with all pre-owned automobiles, the condition is subjective, so I recommend that the potential buyer fly out to inspect as well as test drive any of the vehicles before finalizing purchase. If your personal inspection is not possible, I will be glad to help facilitate an inspection by your chosen local independent service center and will make arrangements to deliver the vehicle to them for this purpose. Please note: Our free templates do not save your entries. You may click the “go back to edit” link or use your browser back button to edit changes. However, if you leave the site your entries will be lost. Click anywhere inside box to select → Copy code → Paste HTML in eBay’s “HTML” description box →Your done! After entering the HTML into eBay’s “HTML” box you switched to “Standard View”. Doing this will strip out some of the original HTML and cause the template to display improperly. You didn’t copy or paste all the code. 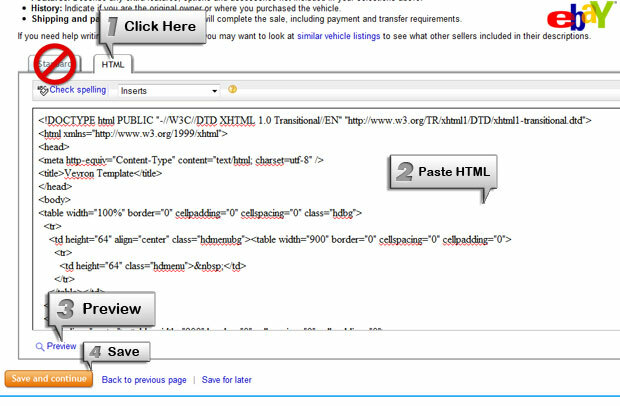 Make sure you carefully select all the code and paste it into eBay’s vehicle description field with the “HTML” tab selected. If you enter the HTML into the “Normal” view your ad will not display properly. You entered too many characters in one of the vehicle specification fields. Example: in the “Engine Type” field you entered too many words, try shortening it to something more concise: instead of Chevy 350 V8 250 horsepower, try entering just 350 V8. You entered too many characters on a sidebar type template. Some of our templates contain a sidebar that stretches downwards as information is entered. Try making your entries in this are more concise or deleting a few redundant sentences. Your “Featured Image” is too tall. Some of our templates will appear displaced if your featured image is longer than 700 pixels in height. Instead of using a “portrait” style image, use a “landscape”style image then update your template and preview the changes. An ideal featured image dimension would be 800×550 pixels. Your logo is too large. Some templates permit dealer logos. Please review the logo field on the description generator for details of the required dimensions. Exceeding these dimensions can cause the template to distort. If your logo is too large you may want to resize it then upload it to your image host and re-enter the URL into the logo field.